We left Siem Reap on a day-trip to interview villagers in the countryside. Ten minutes out of town, a mango rain (the term for early spring dry-season showers) drenched the road and everything turned swampy. Definitely atypical in the typically dry month of March. It poured until nearly lunchâ€”which means we didnâ€™t accomplish much before the meal. In Cambodia, hunger dictates work. Khmer stomachs operate like clockwork. With the exception of wildlife biologists (who sometimes care more about finding their monkeys than eating their rice), most Khmers I know eat like my diabetic dad: on time and routinely. For many (those fortunate to have so much food), the daily menu might include an early-morning breakfast (5 or 6), a morning snack (9 or 10), lunch (11:30 or noon at the latest, followed by a sufficient nap), an afternoon nosh (3 or 4), and dinner (6). Something like that. Any deviation from the regular feeding of the bodily machine is cause for deep concern. Iâ€™ve learned over the years that when Iâ€™m out reporting a story and Iâ€™ve hired a guide or translator, I must oblige the gut. Fair enough. I certainly work best when sated, too. And so it was that we stopped for a generous bowl of num banh chok before heading off into clearing skies. 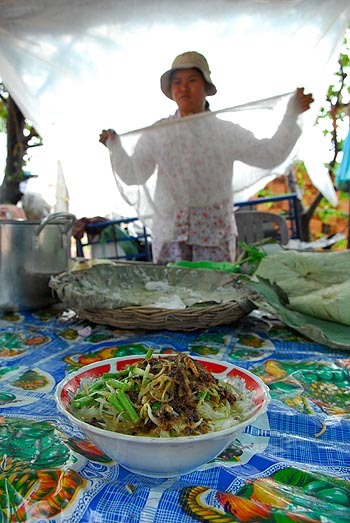 We stopped at a little highway stall where a woman filled our bowls with rice vermicelli, chopped cucumbers, long beans and shredded banana flower. She ladled her pea-green curry (key ingredients: fish, lemongrass, turmeric) over the bowls and offered an optional sweet sauce of fish and shredded coconutâ€”chocolate-brown with a smoky essence that traveled up the nose. Delicious. It added a dynamic element to the dish. And of course, lunch came with the usual pile of fresh herbs, wedges of fresh lime, chopped fresh chile, raw long beans and pinches of salt. I recalled a bowl of num banh chok I had eaten in a Phnom Penh park years ago. That day, I sat with a couple of Khmers who wanted to converseâ€”but first they insisted we prioritize. â€œIn Cambodia, we say eat first, then talk,â€ one young man told me. â€œThis is our culture.â€ So we slurped our bowls in silence, then sat back to a chat. Karen, I love these reports and the descriptions (photos) of simple food served in the countryside or at small food stalls. What an adventure. Just curious, but does anyone in the Asian hinterlands eat whole grain rice? Isn’t that what the peasantry used to eat? Do the people you meet have any thoughts on the nutritional value of their polished rice products versus whole grain? The lunch sounds super yummy, wish I could be there to partake! Keep having fun out there! It’s so amazing hearing the stories, I can’t get enough. That schedule’s held to around Asia, regardless of location (urban or rural) or income level. Thus office workers in Bangkok toting bags of goodies in the morning – for 10am snack – and after lunch (to help make it through till 5p). I don’t know a single Malaysian who doesn’t snack betw bkfast and lunch and lunch and dinner. Many throw in a late-night noodle too. When American doctors determined that eating less, more often, was the way to go they were a bit late to the bandwagon. And to Ed – I don’t know abt Cambodia but in Thailand and Malaysia certainly, unpolished rice is eaten. Thanks for the comments, everyone. Yes, Jojo, people do eat on a pregnant woman’s schedule! Robyn is right, it’s common eating routine throughout many parts of Asia. Healthy, too. On polished vs. whole grain rice, both are eaten, although there is a lot of preference for polished white. Unpolished grains have long been associated with the poorer populations (not just in Cambodia, but in many places). I recall an interview I had a few years ago with Khun Vanli of Bangkok Airways, which has its own organic rice fields around the Sukhothai airport. She and her team have tried for years to persuade more farmers in Central Thailand to grow organic rice and to eat unpolished varieties. But it’s a tough sell that goes against habit. Some people consider unpolished rice fit for prisoners, she said. So, while there is an organic and “healthy” rice movement of sorts (and a push to export more of these rice varieties), it’s not entirely mainstream. That sort of nutritional reasoning behind eating whole grain rice tends to surface in cities. In the countryside, people eat what’s available, affordable and culturally acceptable. A lot of people still prefer their rice to be nice and white. This is the best sort of food, isn’t it? Sure, fine dining is great (I would say that considering I’m a student at a culinary school, after all!) but there is something special about these simple meals, isn’t there? Wondering if you know the phrase in cambodian for “mango rain”? Love your photos btw! Chickpea, a direct translation would be sway pliang. But let me ask around to see if there is another way of saying it in Khmer. Thank you. I appreciate your response. I’ve just found your site and am thoroughly enjoying your posts and pics. Thanks, Chickpea. Actually, I should have written “pliang sway” rather than “sway pliang.” Sway = mango, pliang = rain. The adjective comes after the noun. In any case, I asked around yesterday as a heavy mango rain pummeled the Khmer Rouge Tribunal courtroom — aside: it rained for the first time in months on Pol Pot’s death day in 1998 — and discovered an entirely different phrase that Khmers have to mean essentially the same thing as mango rain. “Pliang p’saing kroatch,” which means literally “rain skin orange.” It was described to me as a light shower that dampens the skin of an orange, then rises in mist as the rain dries and sunlight returns. I discovered the term “mango rain” on your blog, but when I mentioned it in Cambodia the people I asked weren’t familiar with it. Do you know how to say that in Khmer? Or are you sure it’s a Khmer expression and not a Thai expression? I used the expression in an article that will be published soon, so I’d like to be sure. Thanks. Andy, “mango rain” is a phrase that many of our Khmer friends have said to us (in English) over the years. I don’t really know the origin of the term, but I first heard it from Khmer people in Cambodia when we first lived there. I also recently learned another Khmer term (see above), which means essentially rain that dampens an orange skin. I searched on Google and found a few more references to mango rain and mango showers in Thailand and Cambodia. I think that’s enough for me to confirm it. Thanks. Ah, one more thing, searching for “mango showers” produced a Wikipedia page. The term seems to be common in India and used in Southeast Asia as well. Haha! Grat article, I discovered this website by accident trying to search up information on “Mango Showers”.. if it meant exactly what I had in mind. Anyway, as I was reading your article I was laughing because it’s true, hunger dictates the work and food. One reason to get up early in Cambodia is because ONLY the early bird gets the worm. If you miss the food, you’ve missed it till dinner! People work and eat at a certain time, and there’s no food when nobody is working and providing food. It’s not like in America where you can get food all throughout the day and night if you’re hungry. So convenient. Well, I’ve bookmarked this page and I’ll be back time to time to stop by and read through a few during my leisure. I’ll also look into that book you have on the side there, “Cambodia Now”. Hi Jin, thanks for visiting. So true! It’s never advisable to eat at an off hour in Cambodia. I admit, I’ve had a hard time adjusting my body clock (which much prefers late nights and late mornings), but the pickings are slim if I sleep too late in Cambodia.